Pattern Description: Misses easy to sew tops. 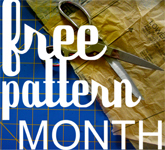 What did you particularly like or dislike about the pattern? Didn't like the bias tape for a casing along the neckline. Worked OK for me because I was able to get a reasonable colour match, but would consider self fabric if I couldn't. Pattern alterations or any design changes you made: left out the ribbon tie because I want to wear it with a long necklace & pendant. The ribbon might make it too busy. Conclusion: Great Pattern, easy to sew. Would make a great beginner project. Thinking about making the short sleeve version for summer. A longer version would make a great beach cover up. That is so pretty, feminine, flirty. It would look beautiful with cream color skirt or pants. Nice work! I just found your blog and am enjoying reading your posts. I just posted about this pattern too. I think I have sewn it 4 times now! Great blog. I really like this pattern. Sometimes simple is best because it gets the most use in your closet. I haven't had this version yet. Super cute. Should I Trust the Instructions? Ribbon Blanket for my Granddaughter - I made a ribbon blanket for my granddaughter. She loves it. The last two pictures are in progress. Instagram! - Follow me on Instagram if you like – that’s where I’ll continue sharing what I sew. New Name, New Location! - I'm really excited to announce that my blog has moved to a new location! Check it out at MegMadeThis.blogspot.com.